The Ferret Scout Car Mark 2/3 was developed by the British Army in the late 1940s and came into production in the 1950s. The Australian Army used Ferrets as scout cars until the 1960s and they were disposed of by public auction in the early 1970s. The Ferret is a light armoured car intended for light reconnaissance work. It carries a driver and commander, and the turret houses a 30 calibre Browning machine gun. Fuel consumption is approximately 34 litres per 100 kilometres. The vehicle weighs 3.6 tonnes, although a combat weight would be 4.3 tonnes. It is constant four wheel drive and has a top speed of 100 kilometres an hour. The Ferret Scout Car, in all its marks and models, has seen service in over 36 countries and has only recently been phased out of the British service. 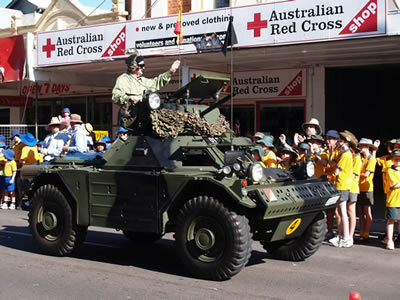 It is recognised as the best conditioned example of a Ferret Scout Car in Australia. With a top speed of 65 mph, this model was produced by Harley Davidson in WWII to US army specifications shown by the 'A' in WLA. It was based on an existing civilian model, the WL, and is of the 45 solo type, so called due to its 45 cubic inches (740 cc) engine and single-rider design. Over 90,000 were built for the American army in WWII with production being revived for the Korean War. After WWII many of these motorbikes were 'civilianised' when young soldiers returned and bought motorbikes like they rode or had seen in the war. 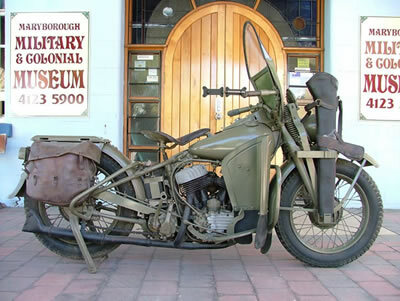 This led to the popularity of both motorbikes and the Harley Davidson company.